This past Saturday, the Virginia Beer Blog crew had the immense pleasure of joining press, construction partners, and local leaders for a private event appropriately titled "Stone Brewing Breakfast Pour". Located in the recently erected skeleton that will become Stone Brewing Richmond, the event provided breakfast by Alchemy Coffee, Slideways Mobile Bistro, and Boka Taco Truck, which was sponsored by Hourigan Construction. 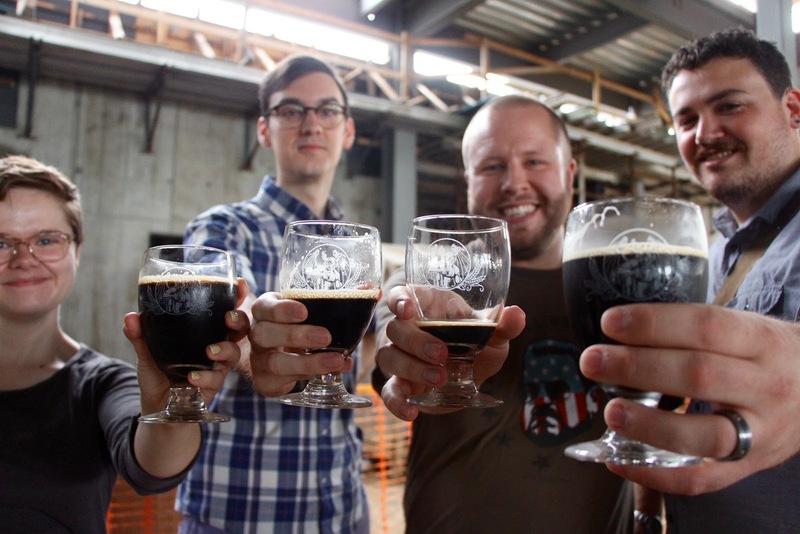 The highlight of our breakfast had to be the "Stone Concrete and Coffee Stout," brewed exclusively for the event. This 8% ABV marvel complimented the warm welcome and familial camaraderie of genuine craft beer enthusiasts. We looked on as tons of concrete were poured into the molds that will support the 40 massive (an understatement) fermentation tanks that will make up Stone's new "Tank Farm." When completed, the Tank Farm will rise five stories into the air, encased in glass, a monument to craft beer for all to see. Representatives of Stone informed us that once at full capacity, the Richmond Brewery will outproduce the Escondido location with two and a half times the production! Looking out across the soon-to-be Tank Farm, it's easy to see why Stone Brewing picked this location out of so many. 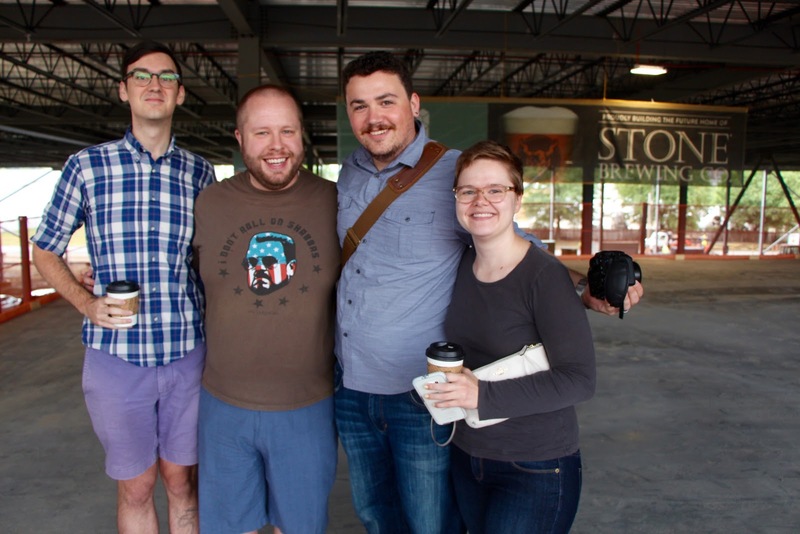 Centrally located between Downtown and Richmond International Airport, the brewery will be located along Richmond's new Bus Rapid Transit (BRT) loop, "The Pulse". We were told that access to public transportation was a high priority of Stone's, when considering locations. The Greater Fulton location is also of major historical significance; the site is located just yards away from the Eastern entrance to the famous Church Hill Tunnel and the ruins of the Fulton Gas Works (see above picture). Few know of the centuries old beer caverns that flank the new construction: The James River Steam Brewery Cellars, located beneath the Rocket's Landing neighborhood, and the Chimborazo Park Beer Vaults. I'm holding out hope that the inevitable jolt to the East End's economy will help bring these two locations a rebirth and long overdue care because who wouldn't want to have a drink in an underground cathedral dedicated to beer? The economic impact to the Greater Fulton Community is another very exciting aspect of the development, the neighborhood was the victim of revitalization gone terribly wrong. In the early 1970's the Fulton Neighborhood was severely damaged by Hurricane Agnes and subsequent flooding. The remaining neighborhood was leveled in what was promised to be a massive rebuilding project, a project that never came to fruition. The area currently lacks a grocer, library, school, and post office and has only recently rebounded in housing. Half of the foundation of the Fermentation Tank Farm had already solidified, while the other half was poured as we looked on. The sheer scale of the project is beyond impressive. Thankfully, I didn't have to feel bad about having a beer and breakfast while watching the crew labor, as they eventually were able to partake in the festivities. The project is being financed by the City of Richmond, with Construction being handled by Hourigan Construction. Stone Brewing will pay the city back through a 25 year lease on the property with the option for the brewer to purchase the property at the end of said lease. Of course, the brewery gets the spotlight now, but it's important to remember that Stone comes with the whole package: Parks, trails, and Stone World Bistro and Gardens. The green space for this project will be more than welcomed to the neighborhood. Trails and gardens will connect the brewery to the restaurant about a block away. Stone World Bistro will be located in the most unique of buildings, the Intermediate Terminal Building. With East Main Street Running to the North of the building, the James River to the South, and Wharf Street currently running beneath, the property is unlike any other. Stone plans to have the massive (ugly) concrete pad and road beneath the structure replaced with sprawling green space and beer gardens. The possibilities of the space are truly exciting. I hope that, with this project, a long overdue cleaning of Gillie Creek (parallel to the property) will be included. Four Fifths of the VBB Crew. The prospect of new jobs (temporary and permanent) was a major factor for Richmond wanting this project, and I look forward to meeting the new staff as they arrive, but it's also important to remember those in the area who already worked for Stone and those who chose to make RVA their new home. I have had the pleasure of speaking with Stone's Regional Brewery Rep. for VA/DC/MD, Rich Taylor. He is local and serves as a great ambassador of the brand. I can only imagine that he is excited to have this project in his back yard. During the concrete pour and tour, we also had a chance to get to know Stone's Director of National Sales, Jason Armstrong. It was a true pleasure conversing with him and his wife. They came to the Richmond area this past Spring and are quickly becoming acquainted with the area. As Stone's 20th Anniversary is coinciding with the opening of the Brewery in Richmond, we are all in for a good time. The inevitable 20th Anniversary Beer and (one can hope) a welcome to RVA special brew should be right around the corner. 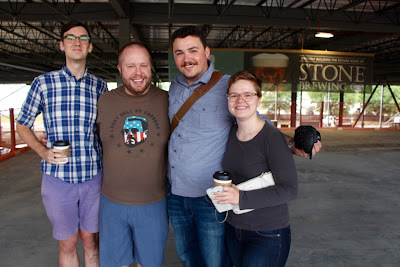 On behalf of the Virginia Beer Blog Team, I want to thank Stone Brewing and Hourigan Construction for letting us be part of such an awesome moment in Fulton's History, Richmond's History, and Beer History in general. It was one hell of a way to start the weekend. What will become executive offices and conference rooms. Discussing how Stone will benefit the surrounding neighborhood. More than just concrete being poured here. A toast to an exciting future! Jessica, Ercell, Myself, and James.